Denis Orynbekov and Fela Davis combined their expertise and experience as live and studio technicians to create their own New-York-based company, 23 db productions. After training at Full Sail University, Fela notched up experience as sound crew on the long and punishing slog from one live gig to another – with standout memories being the wireless division of well-known TV production company Clair Broadcast, House of Blues, and Iridium Jazz Club, the latter two among the most legendary live venues on the planet. Now, when she’s not mixing for 23 db productions, she can be found at the FOH desk at Iridium Jazz Club, doing live mixes for Grammy-nominated jazz bassist Christian McBride or world music star Ottmar Liebert. Denis Orynbekov came to New York from Kazakhstan in 2009 to fulfil his dream of a career in music. He not only mans the mixer, but also takes to the stage himself with his trio, The Clox. With two albums and an EP under their belt, they have a great reputation on the indie scene and are among NYC’s top bands according to The Deli Magazine. 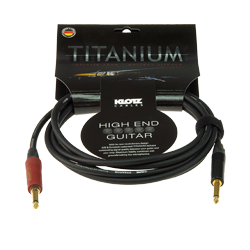 Denis and Fela’s YouTube channel delivers audible proof of the class of Titanium guitar cables in a comparison with a conventional instrument cable. “Titanium cables deliver awesome power! I can get a louder, clearer signal in the overall mix but need less gain to do it. Denis and I have even invented our own language for this when we record: ‘Let’s pull this from the KLOTZ!’”.